Seat covers can upgrade your vehicle’s style and make it feel like new again. Whether you want to hide worn-out seats or want to improve the interior, check out the seat covers from Cap Connection. Currently, we have a variety of seat covers from Covercraft and Fia. 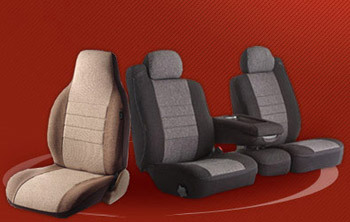 Seat covers from Covercraft are built to last and provide extra cushioning for increased comfort while driving. These covers fit most pickup and SUV bucket seats, as well as sport bucket seats. Cap Connection has a variety of Covercraft colors to choose from. Our Fia seat covers are slip-resistant to keep the material from sliding around while you’re driving. These covers mold to the contours of the seat for a perfect fit. These covers come in charcoal, gray, and taupe colors. Cap Connection will install your new seat covers in just minutes. Contact the truck experts at Cap Connection for more information on our seat covers.